Carbon is a famous element. 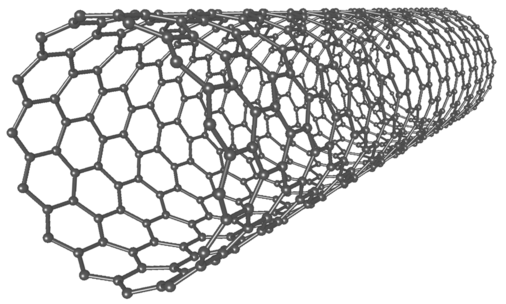 Carbon nanotubes, bucky balls, diamond and graphite are all well known allotropes (forms) of carbon. In many cases, the carbon in everyday objects isn’t a pure allotrope. It might have areas of disordered (amorphous) carbon as well as areas that look a lot more like graphite. This ability of carbon to have many different structures is what makes it so useful. Carbon properties can be chosen depending on where it is used. For example, carbon can be found in strong bicycle frames. Other carbons are used in filters that can adsorb pollutants from water or odours from air. Ordered ‘graphitic’ carbons, such as graphene or carbon nanotubes, can have remarkable electrical properties that make them desirable for devices such as batteries. One of the big challenges for the future of carbon research is how to incorporate such complex properties into a sustainable material. If carbons are to address key challenges such as clean water and energy generation and storage, they must be sustainable.